Old world style stew, plum tomatoes, potatoes, peas, string beans, zucchini and more. Slow cooked on top of stove, in the oven or in a crockpot it's fantastic. My go to recipe always. One more thing in there, that's a secret ingredient that makes this sauce so fantastic to dip your bread in, read on. Place the plum tomatoes through a food processor until pureed. 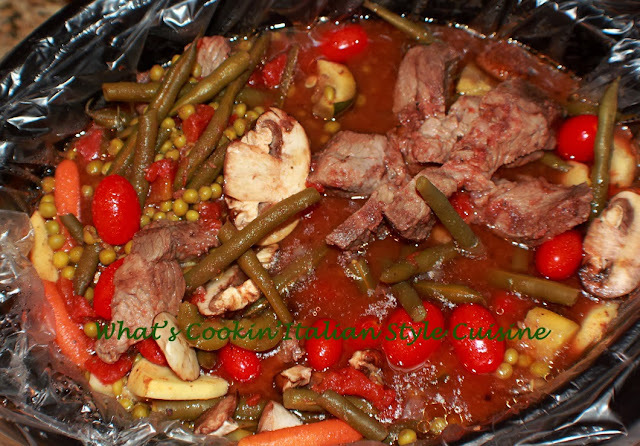 In a large crockpot or 5 quart saucepan place all the vegetables and meat ingredients in there raw. Add in all the spices, then the wine and stir. Simmer on low in the crockpot 8 to 10 hours. On top of stove or even in a safe cook pot in the oven for around 3 hours (or until the meat is tender) on low. Add the fresh basil at the end when it's cooked around 3 fresh leaves. 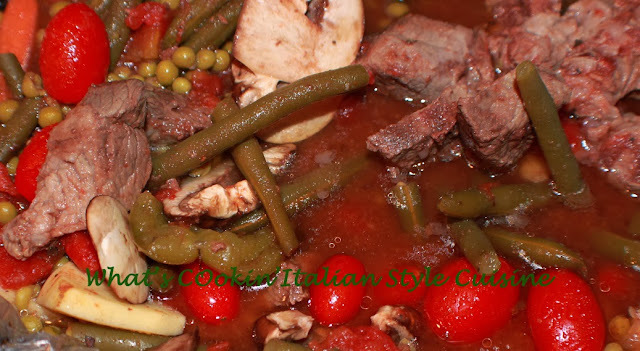 The meat will fall apart and the stew will make a wonderful sauce to dip your favorite Italian bread in. A great rustic bread is Ciabatta give that a try!